Commenting on Urban Redevelopment Authority’s (URA) statistics, Ms Tay Huey Ying, JLL’s Head of Research and Consultancy for Singapore said the tightening office space supply amid firm demand drove office rents further north. The URA release of 3rd Quarter 2018 (3Q) real estate statistics showed that prices of office space increased by 0.1% in 3rd Quarter 2018, compared with the 1.9% increase in the previous quarter. Rentals of office space increased by 2.5% in 3rd Quarter 2018, compared with the 1.6% increase in the previous quarter. As at the end of 3rd Quarter 2018, there was a total office space supply of about 793,000 sq m GFA of office space in the pipeline, compared with the 725,000 sq m GFA of office space in the pipeline in the previous quarter. The amount of occupied office space increased by 45,000 sq m (nett) in 3rd Quarter 2018, compared with the increase of 74,000 sq m (nett) in the previous quarter. The stock of office space supply increased by 28,000 sq m (nett) in 3rd Quarter 2018, compared with the increase of 60,000 sq m (nett) in the previous quarter. As a result, the island-wide vacancy rate of office space dropped to 12.0% at the end of 3rd Quarter 2018, from 12.2% at the end of the previous quarter. Demand for office space has continued to outpace office space supply for the fourth consecutive quarter in 3Q18, and this has driven a fifth straight quarter of rent growth. 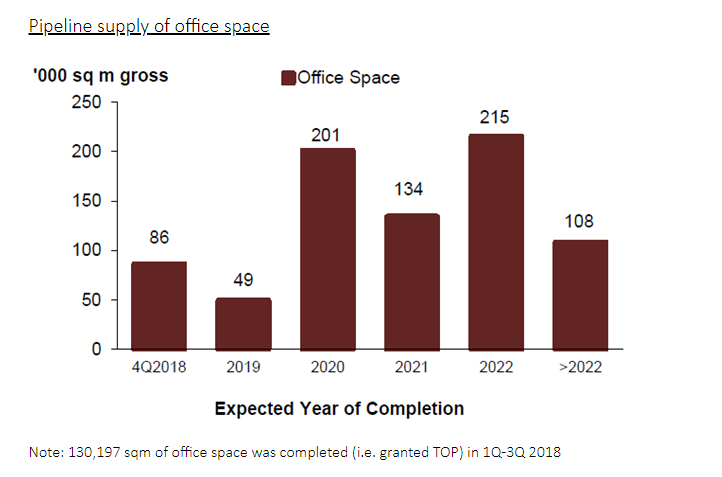 JLL noted that based on the URA’s statistics, only 49,000 sqm gross floor area of office space is expected to be completed in 2019. This is just about half of the 86,000 sqm expected to come on stream in 4Q18 on top of the net new supply of 99,000 sqm that was injected into stock in the first three quarters of 2018. An earlier research by JLL showed that office leasing market in Singapore is tracking expectations with Singapore office rents climbing for the sixth consecutive quarter in 3Q18. Specifically, the gross effective Singapore office rents of Grade A office space in the CBD edged up 2.3 per cent quarter-on-quarter (q-o-q) in 3Q18 to average SGD 9.93 per sq ft per month. The reported predicted that by the end of 3Q18, CBD Grade A Singapore office rents had climbed a steep 18.0 per cent over six quarters and are a mere 6.0 per cent below the 1Q15 peak of SGD 10.56 per sq ft per month. It is not surprising, therefore, for rent growth to moderate. In fact, JLL’s research indicates that the pace of CBD Grade A rent growth has been decelerating for three consecutive quarters, from a recent high of 4.2 per cent q-o-q in 4Q17, to 2.3 per cent q-o-q in 3Q18. Are planning to capitalise on good grade office space supply outside CBD by investing in commercial properties but unsure of funding? Don’t worry because iCompareLoan mortgage brokers can set you up on a path that can get you a commercial loan in a quick and seamless manner. Alternatively you can read more about the Best Commercial Loans in Singapore before deciding. Our brokers have close links with the best lenders in the industry and can help you compare Singapore commercial loans and settle for a package that is tailored and best suited your commercial purchase needs. Whether you are looking for a new commercial loan or to refinance, our brokers can help you get everything you need, right from calculating mortgage repayment, comparing interest rates all through to securing the loan. And the good thing is that all our services are free of charge. So, it is all worth it to secure a bank loan through us.